Whew, rough day yesterday! Our little puppy Wilbur got a little “snip-snip” yesterday if you know what I mean! He is honest to god the saddest, most pitiful little baby I have ever seen. His eye’s are all foggy from the anesthetic and he just hangs his puppy ears and wants to lie wrapped in my bathrobe at the foot of my bed. The worst part of it is the cone. (At least the worst part to me!) I hope that he is feeling a million times better over the next few days, but in the mean time, putting dinner on the table last night needed to be fast so that I could get back to my ailing puppy. I made some tasty grilled salmon, steamed rice and a carrot salad that I treated like a slaw to eat with the salmon. This is the most simple salad that I am sharing today, but sometimes it’s the simple things that are the most lovely. 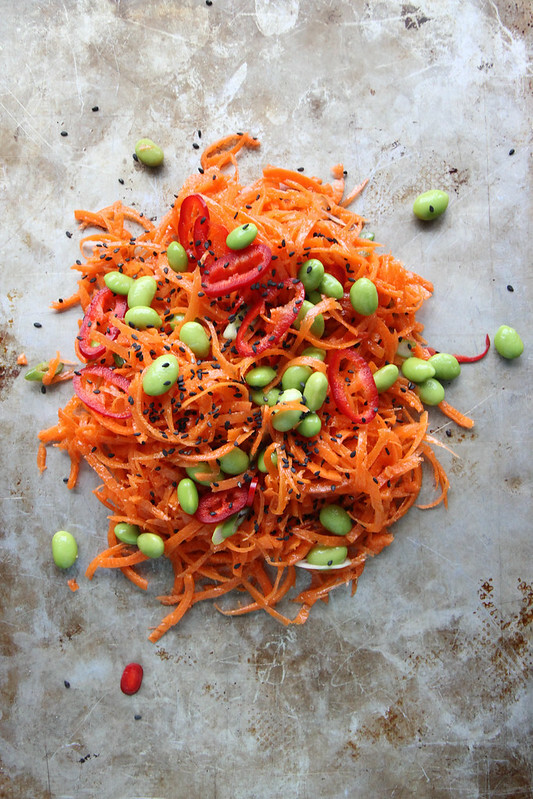 The bright fresh flavors, colors and textures of this salad just make me happy. The vinaigrette dances on your tongue with the spice and the bite of the vinegar with the sweetness of the sesame and agave. It was amazing on its own or along side a bite of the grilled salmon. It would also be awesome in fish tacos or with some chicken or grilled shrimp. YUM!! 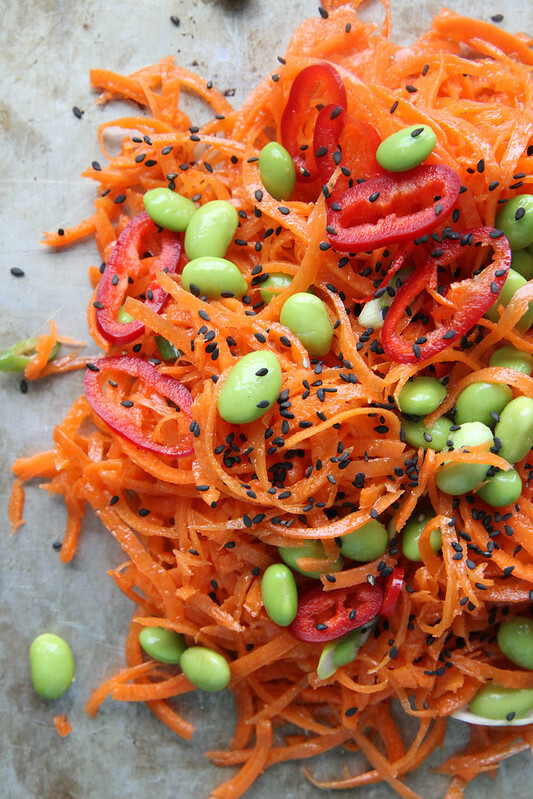 Toss the carrots, edamame, chili and sesame seeds with the vinaigrette and gently toss together. Season to taste with Kosher salt. Hope Wilbur feels better soon. This salad is just gorgeous, love the vibrant colors! This sounds amazing, just the type of recipe I’d like to throw together tonight. But, before I do, could you verify that 8 shredded carrots only yields 2 servings? I will be making this for our family of 5. So, as a side dish alongside rice & protein, could I just add maybe 4 more carrots + 1/2 recipe vinaigrette? Thank you — can’t wait to make & serve this. I’ve got some salmon patties ready to grill & craving some yummy fried rice too! As always, your food is beautiful and delicious. Wouldn’t this be a colorful and healthy meatless Monday combo with your avocado pizza from the other day? Responsible pet owners spay and neuter! Wilbur will be back to his old self in no time! Thank you Kelley 🙂 He is in such bad shape it feels good to hear you say that. This salad looks like the only carrot salad I’ve ever liked. It was made by a Gujarati friend and had mustard seeds. It is so hard to watch an animal be spayed or neutered but so necessary. A few days will make all the difference. I love making salads like this!! So colourful and yummy! This salad looks beautiful and sounds amazing! I can’t wait to try this salad! Hi. This sounds amazing. How far ahead can it be made? Thanks! I think if you don’t mind things looking slightly wilted, a couple days even! 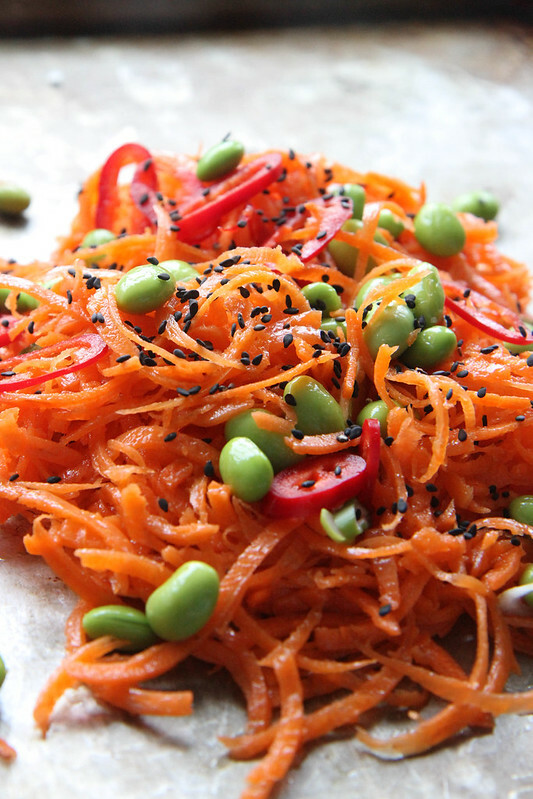 Though carrots will hold up very well to dressing. You could also assemble the vinaigrette separately and keep the shredded carrots in a ziploc and simply toss together day of. Made this tonight, and wow!! It is fantastic!! I added a red bell pepper and used a jalapeno instead of a Fresno chili. I will be making this regularly. Thank you for the wonderful, fresh recipe! Oh good Jenni! Love the delicious changes you made!